Update, July 28, 2017: We now have an answer to one of the questions below (the entry has been updated to reflect this), but the reveal of the Destiny 2 pre-order bonus trace rifle, Coldheart, has raised another. As a new weapon class, it's radically different to anything in the beta. So just how many more of the game's gear and systems secrets did Bungie hold back from the public play-test? We’ve spent a good, long time in the Destiny 2 Beta since the early access version launched on Tuesday. We’ve discovered a lot. We’ve explored all the many gameplay changes and alterations in the game’s focus. We’ve dug deep to provide tips on a whole bunch of stuff that the beta doesn’t tell you, and we’ve compiled a list of the 10 things you absolutely must do when you get access, if you haven’t already. But as many things as we’ve learned, we have even more questions. We have questions about game systems that have been previously hinted at, but which remain unexplored in the beta. We have questions about whole new systems that we didn’t even know existed before the beta. And we have a whole lot of questions about just where, exactly, the story is going. Below, you will find those questions. But, to ensure that we’re actually doing something useful here as well, you’ll also find our current best attempts to answer them. Are ability cooldowns really too slow? There’s been a fair bit of complaint in the community over the last couple of days regarding cooldown timers for abilities. There’s a general feeling that they’re too slow at the moment, and with the traditional customisation stats of Strength, Intellect and Discipline now removed from armour, there’s no way to change them. This criticism though, might well be a bit premature. It’s important to remember that for long-timer players, the Destiny 2 Beta, with its pre-rolled characters, represents a major contrast to the kind of gameplay we’re used to. Having built, tweaked, and honed our characters for years, our own Guardians are likely now entirely tuned up to our own liking, and pretty damn powerful with it. Jumping to non-optimised, vanilla characters is inherently going to be jarring. And besides, we don’t currently know all of the progression systems that Destiny 2 will give us to customise things with once we get into the final game. A whole bunch of mechanics are missing or locked off at the moment, and so there’s every chance that something in Destiny 2 will let us modify cooldowns in some way. The extensive-looking armour and weapon mod slots currently feel like the best bet. How do weapon and armour mods work? We know that they exist, and we know that the grid that holds them seems to be pretty damn big - implying a serious level of long-term gear customisation, far more granular than in the first game. The gist seems to be that we have a limited number of open, category-specific modification nodes for each piece of gear, but 14 inventory slots for each one, implying scope for a huge amount of chopping and changing on the fly. Beyond that though, it’s guesswork. How many different elements of weapon and armour behaviours will we be able to customise? What will the different categories of mod slots cover, beyond weapon polarity and colour? One of the weapon slots presently only contains the currently standard Infusion ability, and the question of what we might want to replace that with is a mysterious one indeed. And how will we get hold of these mods, and how much agency will we have in the process vs. waiting for random drops? There’s a lot still to be revealed, but I’d be willing to hazard a guess that there’s a really big, hitherto unexplained part of Destiny 2’s character crafting game waiting to hit us in the face on day one. They look to be a new form of currency for upgrading gear, but how will they work? Their name - heck, their general existence - evokes slightly uncomfortable memories of the early, grind-heavy days of the first Destiny’s economy, but surely Bungie isn’t going to re-complicate things after refining everything so smoothly in The Taken King? We’re going to keep a very close eye on this, and hope that we just find bagfuls of Shards everywhere we go when Destiny 2 launches. Can we mix and match ability sub-sets within subclasses? Update: It has now been confirmed by Destiny 2 project lead Mark Noseworthy that the two skill clusters cannot be combined, but rather will indeed exist as distinct, selectable paths. 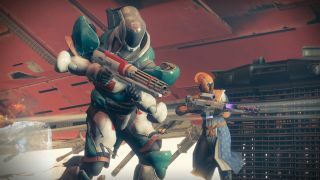 Community response has, understandably, been mixed, but until the full scope of Destiny 2's RPG side is revealed, we can't know whether this restriction will be an issue or not. At the moment, only one of each subclass’ ability clusters is unlocked. There are four more tantalising, unselectable options at the bottom-right of the character screen, and they sound every bit as powerful, exciting, and innovative as the ones we have access to in the beta. But the big question is this: Once we unlock them, will we be able to mix and match top and bottom abilities - say, activating three of one and one of the other - or will they be distinct, exclusive sets? The powers in each grouping in some cases seem deliberately designed to feed off each other and amplify each other’s effects, but it would certainly make sense within Destiny 2’s increased focus on player freedom if we were able to find our own ways of using them. What's going on with the 'Resilient'? Interesting point: Despite the Destiny 2 Beta’s focus on the Cabal and Vex, there is something very similar to the Fallen in there too. If you hang around for long enough near the beginning of the Inverted Spire Strike, you might spot a Fallen dropship warping in to dispense its crew. Even more interesting point: On close inspection, while these combatants’ character classes parallel those of the Fallen, the ones we’ve seen lack the species’ traditional, quadruple arm set-up, and the word ‘Fallen’ doesn’t appear near their health bars. Instead, it says ‘Resilient’. Are these a new but related species, with a slightly different culture and physiology? Are they a hold-out splinter faction, who’ve broken away from the (rumoured) disbanded, and possibly now-friendly mainstream Fallen? That idea syncs very well with current story theories, but - unless Bungie drops more clues into the Beta, or the original game - we’ll likely only find out for definite in September. Are we literally wading through Vex in that lake on Nessus? Another lore theory: It has been posited, with good justification, that the Vex are not actually robots, but rather the white goo that comes out of them when you shoot those robots. The machines are more like vehicles, used to allow the sentient gunk to navigate the land and interact with more tangible species and environments - chiefly by shooting them up and colonising everything they can. If that’s true, then on Nessus, the setting for the Inverted Spire Strike, we are surrounded by Vex. Millions of Vex. We are, if we go exploring that lake, up to the knees in Vex. So is the theory correct? If so, the state of Nessus surely means that we’re going to find out a lot more about the race in Destiny 2. Heck, one of the scheduled expansions is based on lost Warlock Osiris, and Osiris has a big history with studying the Vex. Again, all the pieces seem to be floating together. Will we get to use any of our existing guns at all? We know that all of our gear will be lost at the start of Destiny 2, but the Beta’s version of the opening Homecoming story mission - extended from the edit we saw at the game’s reveal event - raises the question of how close to the start that’s going to happen. We now know that our Guardian is away from the Tower when the attack happens, presumably with some of their gear on them. They’re hardly likely to go out on a mission without guns or armour. So will we get to keep some of our original line-up for Homecoming, losing it only at the end of the level? Or will we just start the game with a whole new set, for reasons? It’s an interesting question of gameplay vs. narrative. On the one hand, our existing gear doesn’t fit Destiny 2’s weapon class system. On the other, it’d be a bit of a story disconnect to just suddenly find ourselves using alien kit under different systems, with no-one batting an eyelid. How the hell are we coming back from the end of Homecoming? Our Ghost is - at least temporarily - dead. We’ve lost our Light. We’re weak as a baby and barely able to raise our own weight off the ground. Then we get kicked off the side of a ship holding a position very, very high off the ground. There’s surely no way we survive this. I mean maybe, if Holiday is there, waiting to catch us on top of her ship, like the Doc does with Marty in Back to the Future 2. If she happens to be in absolutely the right place at the right time, we might just pull that off. Hang on a sec… Holiday. Doc. Doc Holiday. If we don’t have a Ghost, how are we going to do ANYTHING? Our Ghost is obviously going to come back at some point, but how are we going to survive until then? It would be a pretty weak subversion of Homecoming’s closing drama if everything got fixed in the next cut-scene, but surely there’s going to need to be some sort of safety net so that Destiny 2 doesn’t end the instant we next die? We know that he ‘didn’t make it’, and that his chamber is completely gone, but is he really, completely, fully dead, or just missing until later? We know that Osiris is coming back in some capacity, which - given the Warlock’s previously close relationship with the Speaker, and his radically different ideas - strongly implies a change in leadership philosophy. But would that be a direct replacement, or might it be the set-up for an ideological battle? Only the truth of the Speaker’s survival (or not) will make that clear.